Simon van Hooland qualified as MD in 2001 at the Catholic University of Leuven. 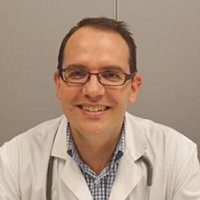 During his Internal Medicine studies, he gained 1 year of ICU experience in Australia, Darwin, NT (2003-2004).In 2005 he started his Nephrology training in UZ Brussel, where he graduated in 2007 as an Internist-Nephrologist. He was active in the Nephrology staff over there as a renal consultant until the end of 2008. Since 2009 he’s working as a nephrologist in AZ St Lucas, Ghent. Medical ultrasound and teaching in the field of Ultrasound for the Nephrologist. He is the founder of Handsonecho, a Belgian practical ultrasound teaching platform (www.handsonecho.com) where he coordinates ultrasound courses with (inter)national ultrasound experts in a variety of clinical specialties. He is currently a board member of the NBVN (the Dutch speaking Belgian Nephrology Association). He lives in the Ghent area. In his spare time he likes sports, music and songwriting.